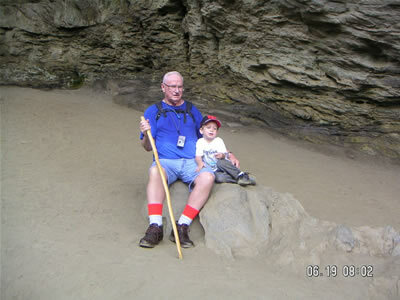 Alum Cave Bluff Trail My son Bob and his son Austin (3), was supposed to hike with my granddaughter Laura and grandson Mike Haythorn last Sunday but Bob came down with the flu and Austin suffered from another severe ear infection. Bob and Austin were sorry to have missed the hike and asked me to hike again today. I was very happy to do so. We left Jensen Beach, FL at about 5:30 a.m. May 31st and arrived at the Quality Inn in Cherokee, NC at about 6:30 p.m. After checking into the motel, Austin wanted to take a walk down by the Oconaluftee River and engage in one of his favorite past times of throwing rocks. I don’t know what it is about little boys but they love to throw rocks. 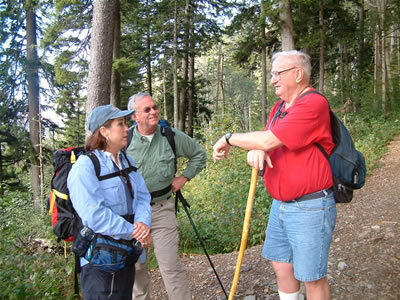 In order to encourage Austin to keep hiking, Bob told him that there was a special present awaiting his arrival at the lodge. Whenever he would seem to be bored of walking, either Bob or I would remind him of the surprise awaiting him. Please note that the photographs with the date stamp were made with Bob’s Kodak Digital Camera. I took the rest of them with my Olympus digital. The following morning, June 1, 2002 the alarm clock awoke us at 5:00 a.m. We planned to be at the McDonalds when it opened at 6:00 a.m. for breakfast and sandwiches to carry up the mountain for lunch. It was a cool 51 degrees when we left the trailhead at 6:55 a.m. Austin was wide awake and ready to hike. I decided to concentrate on Austin and Bob and not attempt to take pictures of the many folks that we met on the trail. 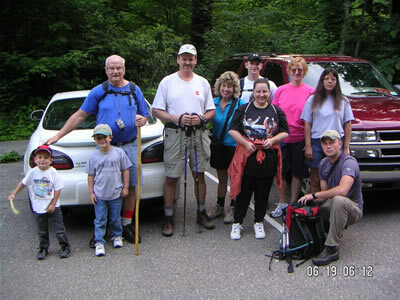 On hike 1271, I misidentified many folks and strangely enough only the younger folks complained. I was notified by several hikers that I had misidentified them as someone from 10 to 30 years older. No one complained the other way around. Austin stopped hundreds of times to pick up rocks and throw them into Alum Creek and later Styx Branch. We were passed by a fast moving couple at the first footlog that we met later. Austin of course was throwing Rocks into Styx Branch. Austin scaled the steps at Arch Rock with ease. Above the last of the four footlogs, Bob noticed a squirrel in the blackberries. We found lots of rhododendrons blooming at Inspiration Point. I photographed several of the rhododendrons while Austin took one of his many snack breaks. I took a picture of the Eye of the Needle and looked for the peregrine falcon’s but I didn’t see or hear any of them. beans. I regret that neither Bob or I took a picture of this calamity. I took time to point out the four peaks of Mt. LeConte to Austin. He remembered the view from his previous trip last October. We continued past the saddle and met or were passed by many hikers. 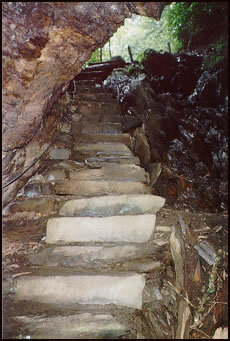 Austin loved the new log steps which replaced the hard rough part of the trail at the site of the Old Man’s stumps. 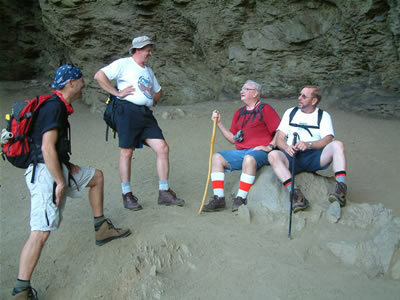 A short time later we met Dr. Kip Miller, Ron Valentine and Ray Ogle descending from their early morning hike. I asked Ron where Marlene Denton was. He replied that she is having her 50th birthday in two weeks and she will be 50 years old and too feeble to hike!! We then met my friends Wayne and Debbie Quarles from Ball Ground, GA.
First I would like to apologize for not recognizing you when we met. I have read about you for sometime now. I hope to meet you on the trail again some day, but next time I will recognize you!!! Patty and I have avoided Mt. LeConte due to the number of hikers that hike it. We have hiked hundreds of miles in the Smokies but unfortunately we have only hiked to Mt. 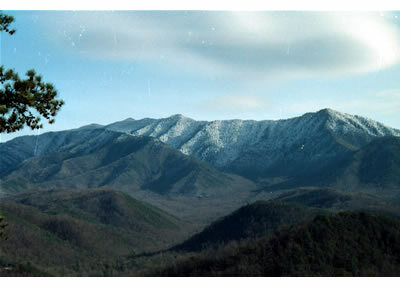 LeConte once and that was Dec.1999. This time we were sure to meet many more hikers than before, but we weren’t prepared for whom we met! But we learned that the people make the journey more interesting. 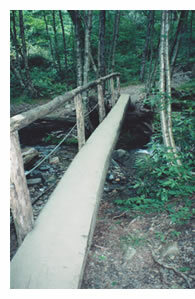 We left Monterey TN at 4:15 a.m. ( EST ) on June1, 2002 which is also National Hiking Day, we drove 150 miles and started at Alum Cave Trail at 7:05 a.m.. We met our first hikers at the first footlog, it was an older man and what appeared to be his son and grandson. The older man was taking photographs of his grandson who was tossing small stones in the clear water below. After giving them a good morning greeting and speaking to the grandson (who was approximately 3 years old) we traveled on. We met a slew of hikers coming down from an overnight stay at the lodge. We arrived at Mt. LeConte at 9:30am. We took a trip up to the Cliff Tops and there we sat and ate a bite, took some pictures, some video and saw some squirrels that were interested in us. We left the Cliff Tops and went to the lodge, there we bought some tee shirts and met some employees that work up there. Around 10:30 a.m. we headed back down. We met several interesting hikers the most interesting person I met was the older man I met at the first footlog that very morning with his grandson. This man apparently loves taking pictures and my tee shirt (which says on the front “HIKE NAKED” and on the back it says “IT ADDS COLOR TO YOUR CHEEKS”) must have caught his attention because he took a picture of it, handed me a business card (which I stuck in my pocket without reading it) and told me to look for the picture on the web after he took our names. We then headed on down the trail, approximately 1 1/2 miles down the trail I decided to read the card and almost fell off the mountain when I realized I just walked off without taking a picture or shaking the hand of the one man every hiker hopes to meet on this trail, Mr. Ed Wright. I wanted to return up the trail and apologize but I still had a 150-mile drive ahead of me and an alarm clock that would be ringing at 3:00 a.m. to tell me it was time for work. So I headed back down the trail and came upon my second surprise, a Peregrine Falcon. We arrived back at the car at 12:30pm to return home. We met a couple on Betty Jane’s Stairways to Heaven. I said a silent prayer for Betty Jane for a speedy recovery. We paused at Paul’s Face and Margaret’s Place to remember these great hikers. The lodge was cool and lots of sunshine. John Mansfield and his young son, Johnny were there and sold Bob T-shirts for himself and Austin. Bob gave Austin a Game Boy as his special surprise. He was happy but had somehow envisioned that it would be a battery powered Silverado toy truck that he could drive back down the mountain. While we were eating our lunches and snacks, Vallerie Mansfield and Ron Underwood dropped by. Ron helped me copy down the Weather Data for 2001 so that I can update that item on my web site. John Mansfield took a picture of Bob, Austin and me. We also visited with Bill Pitt and George Minnigh, Chief Park Ranger for the Greenbrier District. 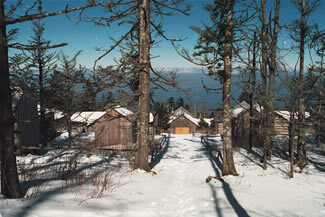 He said that they were going to refurbish the LeConte Shelter with a new roof and front cage during the next 10 days. the shelter will be closed during the renovation. I took one last shot with John, Little Johnny and Austin before heading out. On our way down, we met two, young men, VIP’s who were to help in the work. We stayed at the lodge about 45 minutes before heading down. We paused again at Paul’s Face and Margaret’s Place for views and pictures. Beneath Cliff Top, we met R. G. Webb and Wallace Lyons plus his brother from Center, AL. They had a print of the trail map from my web site. I asked him how he found my web site. He said that while he did not graduate from Auburn, one of his neighbors let him see the copy of the Auburn Magazine that featured my hiking of LeConte. My web address was included in the article. Austin started stopping more frequently and we had lots of slack time, snack time and water time, with Bob trying to keep him interested in walking instead of sitting or throwing rocks. Oh he did lots of snacking also. This gave us time to appreciate the scenery. Bob no longer had the encouragement of the surprise at the lodge. At any rate our average time started slowing but we did continue downward albeit slowly. Near Trout Branch, the Caroline Junco flew out again and Austin located the nest. We met Allison Blauvelt (9 years-old) and her mother Melinda from West Port, CT with Melinda’s sister Sarah Caldwell from Spartanburg, SC. We continued at a sporadic pace to the steps where Austin wanted to stop, snack and throw rocks. I photographed more bluets before meeting Jim Vollmer from Andrews, NC and Elizabeth Wilson from Olney, MD. Jim wanted to send a hello to the Kooks in Australia that follow my web site. We once lived near Olney, MD so Bob and Elizabeth chatted about that area. We enjoyed the views as we descended. Of course we stopped for a while at the bluff and then took another photo of the Eye of the Needle. As before, I did not see or hear the peregrine falcons in this area although Rocco and Pattie Carter mentioned that they had. After another stop at Inspiration Point we continued our trek down. I stopped long enough to photograph some Wood Sorrel. We stopped at the round rock, above and took another rest for Austin to throw more rocks. while we were there, Helen Lobertinii Schaich stopped by and chatted for a while. She gave me the sad news that Margaret Stevenson was in poor health. Margaret had a pacemaker installed a few months ago and within the past five days had gone almost completely blind. She once hiked with Margaret and gave out her cards. She declined my offer to take a picture of her. After much coaxing Austin made it through Arch Rock but could not resist throwing rocks from beneath the footlog there. At this point, we were in for some good luck. A young girl, probably five or six years-old, appeared on the scene with a young couple from Valdosta, GA. Austin took a shine to her and practically ran the last mile and three tenths to the parking lot. He and the young girl stopped and threw hundreds of rocks but they managed to progress fast enough to tax my ability to keep up. I did stop long enough to photograph an interesting tree formation. We completed the hike in just under 10 hours and drove to Spartanburg, SC to spend the night. Austin really enjoyed the swimming pool at the Comfort Inn. When we got up the next morning, Austin wanted to hike the mountain again. 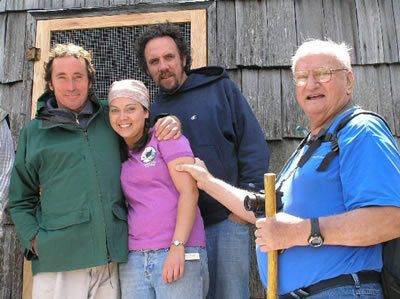 When we returned home, I got the sad news that my friend Eugene Hoffman had died of a massive heart attack at 8:00 a.m. Sunday Morning, June 2, 2002. 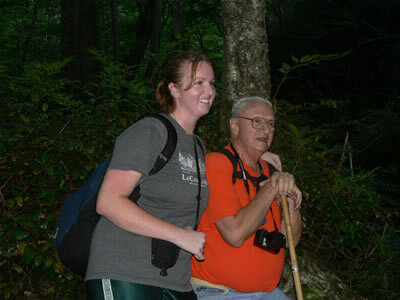 He was a fellow worker with the AEC, Department of Energy and was also a hiking companion. He will be missed. My heart goes out to his widow, Beverly, his fine sons and daughters as well as numerous grandchildren. I have enjoyed great times with this family.